Ecco a voi gli scatti più belli e particolari che ho trovato sul web della New York Fashion Week 2013. Spulciando tra le foto degli street style, ho immaginato quanto sarebbe stupendo, un giorno, potervi partecipare anche io! New York è entrata nel mio cuore l’anno scorso in uno dei viaggi più indimenticabili di sempre, ma durante la Fashion Week deve essere ancora più magnifica! Ora, per rimanere in tema, devo già salutarvi… Tra meno di un’ora si parte per la Vogue Fashion’s Night Out di Milano e non ho la più pallida idea di cosa mettermi… Penso proprio che sarà un’ora molto impegnativa!!! Presto sulla pagina Facebook e sul mio profilo Instagram tutte le foto in diretta da Milano! Here are the most beautiful pictures and details that I found on web of the New York Fashion Week 2013. 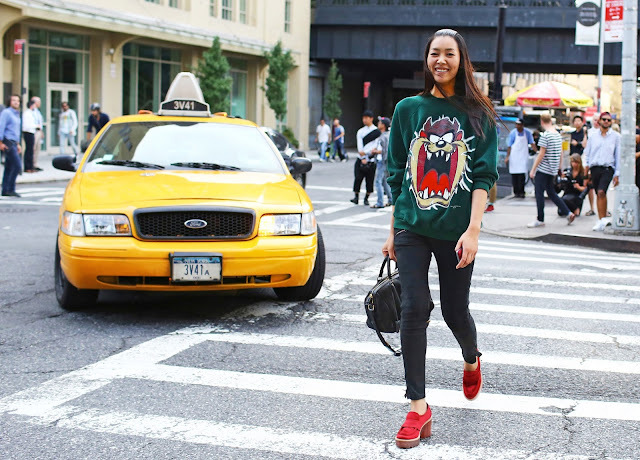 Sifting through photos of street style, I imagined how wonderful it would be, one day, be able to participate too! New York came into my heart last year in one of the most memorable trips of all time, but during Fashion Week must be even more magnificent! Now, to stay on topic, I have to say goodbye… In less than an hour I leave for the Vogue Fashion’s Night Out in Milan and I have not idea what to wear… I really think that will be very challenging hour! Have a nice day fashionistas! Soon on Facebook page and my Instagram profile all the live photos from Milan!